But you don’t have to go back. 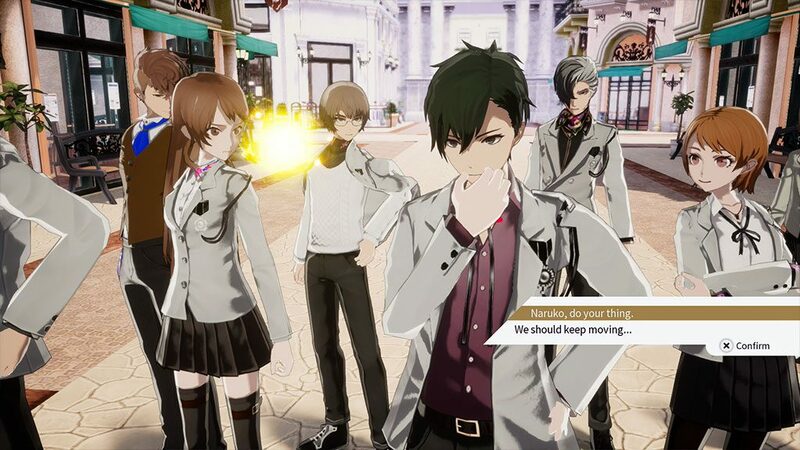 I’m less than five minutes into The Caligula Effect: Overdose when the following things happen: I’m accosted by a J-Pop singer who, playing this game’s version of Professor Oak, asks me if I’m a boy or a girl; I’m in a high school auditorium giving a speech; my character, a very anime protagonist looking dude, realizes he can see that other characters are possessed by some kind of weird dark energy; someone calls me senpai and says “you noticed it, too, huh?”; I am attacked by students who feel very real, very deep loyalty to the aforementioned J-Pop Professor Oak; I am saved by another student with multi-colored hair and the voice of a forty-year-old man; we meet a magical fairy who proceeds to infodump the plot onto us; I realize I am in an alternate dimension created by said J-Pop star, and populated by people with negative emotions to make them dangerous; we are attacked by several people that have been overcome by their negative emotions; I channel my emotions into a pair of pistols to battle them; and I meet a new group of friends who formed a school club bent on getting out of here. 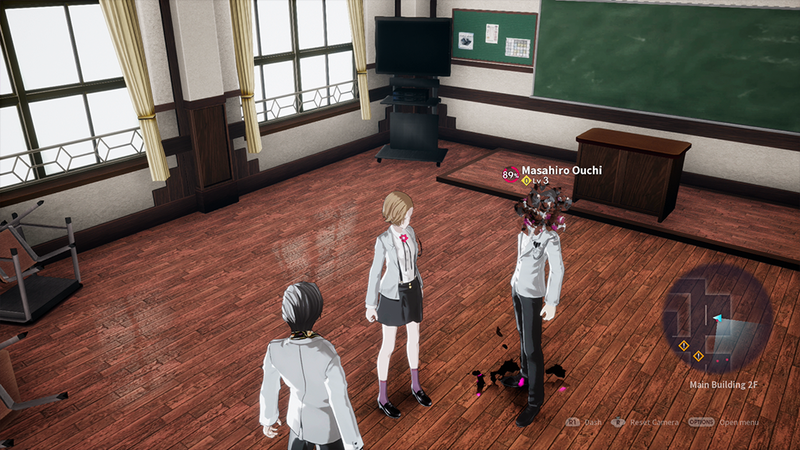 What I’m trying to say is that The Caligula Effect: Overdose is utterly wild and completely Japanese. I couldn’t make this stuff up if I tried. Better yet, none of this is an exaggeration. Mobius, the world you live in, is an artificial construct created by Mu (the actual letter for her name doesn’t exist on my keyboard, so this is a close approximation) and Aria. Folks who listen to Mu’s songs and have emotional trauma get transported there. In Mobius, everyone is young and every day is supposed to be fun. Folks who wind up there end up experiencing high school on an unending loop (why Mu and Aria, who are virtuadolls, thought this would be fun for anyone is beyond me). Problem is, Mu decides that it would be better if nobody ever left Mobius, so she erases everybody’s memories and makes it impossible to leave. The lucky ones realize they’re in a virtual prison. The unlucky don’t, and give into their negative emotions, which warp them into Digiheads, which will attack you without reason. You team with with Aria and a group of students called the Go-Home Club, to try and get out. "Talking to anyone will trigger a vague, stock conversation that you’ll see multiple times if you talk to enough people. What’s worse is that after a short introduction to the topic at hand, the game fades to black and then returns at the end of the conversation. Congrats, this person likes you more now, but I couldn’t tell you why." Mobius is big. This is an enormous game world with a lot to find and more than 500 playable characters to recruit. See, everyone in Mobius has one thing in common: they’re all lugging around some serious emotional trauma. Some become Digiheads; others fade into Remnants, items you can find and equip to boost your squad. The rest are there for you to make friends with. You can do this by talking to them, but some folks are too shy or aloof to talk to you… unless you’re buddy-buddy with their friends. This is where the Causality Link comes in. It’s an enormous web showing every relationship in the game, and will tell you everything about a character, from the particulars of their past to their reasons for winding up in Mobius. Needless to say, making friends with other students is important if you want to build your party. The problem is that the game goes out of its way to make doing this as monotonous as possible. Talking to anyone will trigger a vague, stock conversation that you’ll see multiple times if you talk to enough people. What’s worse is that after a short introduction to the topic at hand, the game fades to black and then returns at the end of the conversation. Congrats, this person likes you more now, but I couldn’t tell you why. Do this a couple times, and they’ll be your friend. Your teammates get a bit of characterization through interactions called Character Episodes, which can be unlocked if you talk to them enough, but otherwise this system applies to everyone. This is also true of the WIRE, Mobius’s text messaging service. The whole thing feels like a chore, a box to check, and since neither method of conversation reveals anything useful about the characters, you have to open the Causality Link to learn anything. This system is made worse by the baffling decision to feature a silent protagonist. I get why they did it – it’s supposed to be you! – but it prevents you from having any meaningful interaction with the other characters. The game allows you to make decisions, but none of them matter. If you choose the wrong person for a mission, the other characters will make the right choice for you. If you decide you don’t want a character to be a part of the group but that character should be, the rest of the group will override you. Mobius may be a big place, but The Caligula Effect always finds ways to make you feel small. "Attacks can leave opponents in any of three states: down, launched, or standing. Follow up attacks can only hit characters in a couple states, so picking the right moves is important. Moves can also interrupt enemy attacks or provide defensive options." The visuals, while remade for the PS4 remake (which is where this version was ported from), are blurry and pretty bland. Most areas are a series of similar looking hallways and rooms populated by a legion of similar-looking anime characters, all of whom have nothing of interest to say. The music isn’t particularly varied, either. While the songs themselves aren’t bad, they play them over and over and over again, and if you spend more than ten minutes in a zone you’ll likely feel you’re going mad. This was originally a PS Vita game, and it shows. The game’s saving grace is its combat system. At its core is the Imaginary Chain, a turn-based system that allows you to chain up to three attacks per character per tun together. Attacks can leave opponents in any of three states: down, launched, or standing. Follow up attacks can only hit characters in a couple states, so picking the right moves is important. Moves can also interrupt enemy attacks or provide defensive options. 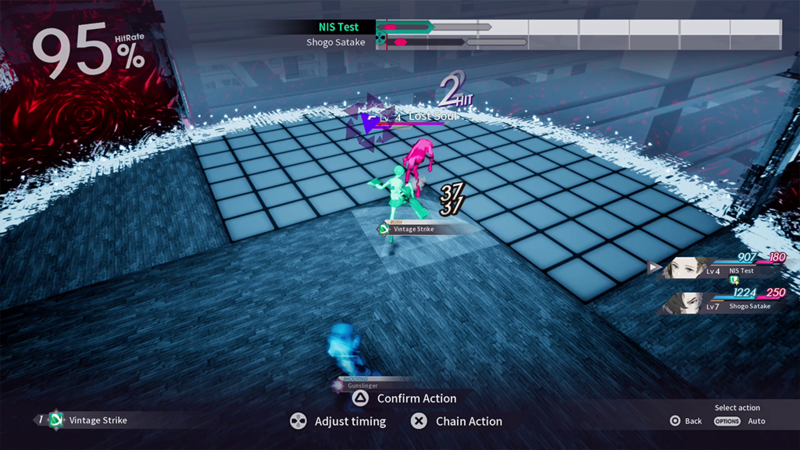 Once you’ve selected the attacks you’d like to chain together, you can view how these things will play out in the Imaginary Chain, and allow you to move your actions up and down the timeline to coordinate hits and maximize damage. The combat system is a lot of fun and works nicely, and the enormous character roster means there’s a lot of character variety. Some characters excel at starting chains; others are great at maintaining and extending them; and some characters live to deal out punishment. Building your team – and selecting and leveling the rights moves (you do this with Skill Points, which are gained by winning battles, leveling up, and finding items in the world) – is crucial. The other thing you gotta manage in combat is SP – Skill Points (I know, but it’s different this time) – which allows you to perform certain moves. Run out of SP, and you’ll have to spend a turn recharging. This isn’t a big deal in smaller fights, though you do fight a lot of basic enemies, but it can be a big deal in boss fights. You need to go into them with the right team, which can be a bit of an issue since you can only change your character in certain areas. It’s possible to go through an entire dungeon, get to a boss, realize you have the wrong setup for said boss, and have to go back and repick your characters, which will involve traversing the entire dungeon again. "The battle system is fun, and the story can be entertaining, but the social system needs works, and the combat, as good as it is, gets repetitive because of the number of enemies you fight. " The Caligula Effect isn’t a bad game, and Overdose does add some nice new things from the original game, including the ability to play as a woman, an alternate story path, and some new combat moves. All of these additions are welcome, but they can’t hide the fact that this is an upscaled PS Vita game that was never anything more than average to begin with. The battle system is fun, and the story can be entertaining, but the social system needs works, and the combat, as good as it is, gets repetitive because of the number of enemies you fight. Couple with the presentation issues, and you have a game with inherently limited appeal. And that’s before we start discussing its subject matter. You can go back to high school if you want. Hell, you might even be happy about it for a little while. But I just like to visit every now and then. Excellent combat system. Some fun characters. Entertaining story. Muddy visuals. Poor social system. Your choices don't matter. Lots of battles, which can be tiring. Repetitive music.